In past Animal Crossing games, Mushrooms have spawned only during November. 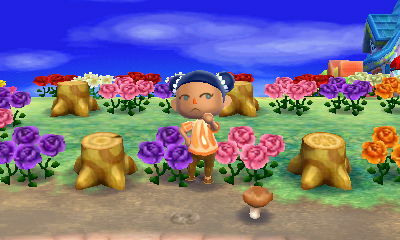 In New Leaf, Mushrooms have expanded their presence. Not only is there a new type of Mushroom to be found, but all Mushrooms are now available year-round. The type of Mushrooms available are listed below, along with their selling prices in Re-Tail. Please note that prices listed are for towns which don't have the Wealthy Town ordinance in place. These Mushrooms will spawn throughout the year and, except for November, appear only around particular tree stumps. All but the Rare Mushroom are easily spotted. The Rare Mushroom spawns only in towns with a Perfect Town Status, and is buried underground. It is marked by a star-shaped pattern in the ground like one that indicates a fossil or other item is buried there. Before launching into an explanation of the type of tree stumps required to attract Mushrooms at any time of year, it is worth first briefly explaining the different types of trees in the game. Cedar - These are dark green trees which grow only in the northern part of your town area. They look like pine trees (think of a Christmas tree), and during the festive season some of them are adorned with lights. In order to grow a cedar tree, you need to plant a cedar sapling. Oak - These trees are lighter in color than cedar trees. They look like the fruit trees found in the town area, but never bear fruit. Oak trees grow only in the town area and not the beach. In order to grow an oak tree, you need to plant a sapling. Fruit - These trees look like oak trees, but each tree produces three pieces of fruit. These fruit trees grow only in the town area and not on the beach where tropical palm trees bear fruit. In order to grow a fruit tree you need to plant a piece of fruit. Occasionally when harvesting a tree bearing native fruit you will find a piece of perfect fruit, which can be planted to grow perfect fruit trees. Bell - These trees look like the oak trees and the fruit trees that grow in the town area. Similarly, they too grow only in the town area and not on the beach. Just like fruit trees that bear three pieces of fruit, Bell trees produce three bags of Bells each containing 30,000 Bells. 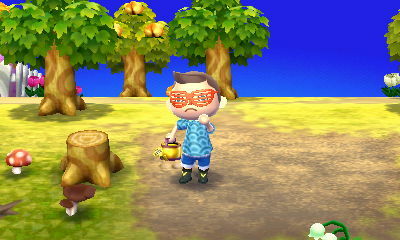 To attempt to grow a Bell tree, you have to bury a bag of Bells using a golden shovel. Palm - These are tropical fruit-bearing trees located in the beach area and not in the town area. Palm trees bear different types of fruit to that of the fruit trees located in the town area. In order to grow a palm tree, you need to plant a banana or coconut on the beach. For the purposes of this guide, palm trees are ignored because Mushrooms always spawn in the town area and never on the beach. They also never produce the particular tree stumps required to attract Mushrooms. In addition, while Bell trees and perfect fruit trees can be used to produce special stumps, the guide ignores them because most people prefer not to chop them down. Finally, it should be noted that we have named the oak trees as such to distinguish them from the Bell, perfect fruit, and fruit trees. It's important to understand that the trees are not called oak trees within the game. Of course, to chop down a tree you need an axe, which have taken on a new role in New Leaf. Every type of axe can create a special pattern on a tree stump, as long as the tree isn't planted on the beach. Each axe is acquired differently and produces different results. All axes must be struck against a tree three times in order to chop it down. Regular - This axe can be bought for 400 Bells from Leif, who sells gardening related items. Depending on the progress of your game, Leif may have a separate shop to the Nooklings or be a part of it. The regular axe will break after being used on only a handful of trees. Using a regular axe will occasionally result in a specially-patterned stump. Silver - This axe can be bought for 8 Medals from the Island Gift Shop, but is rarely offered for sale. You don't need to be a Club Tortimer member for the axe to appear in the Gift Shop. The silver axe is more durable than a regular axe, but will still break after several uses. The major appeal of the silver axe is that it will always create a specially-patterned stump when you use it to chop down a tree. Since it always creates a special pattern, but will eventually break, it is worth buying several whenever you have the rare opportunity to do so. To reduce the wear on a silver sxe, a segular axe or golden axe can be used for the first two strikes of the tree. Golden - This axe is available as a free gift from Leif at the Gardening Center after you've purchased 50 tree saplings. Only cedar saplings and oak saplings count towards the total number of purchases required. Leif also sells flower bags and bush shoots, which look similar to saplings but do not count towards the total when purchased. The golden axe is unbreakable, swings faster, and sometimes creates a special pattern on a stump. Chopping down a tree in your town area and leaving a stump is a good way not only to attract a couple of bugs, but also to provide an outdoor seat for yourself and your townies. 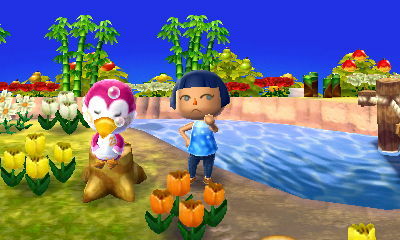 Usually the stumps themselves hold little interest, but New Leaf has brought an extra element. Sometimes when a fully grown tree in the town area is chopped down, the stump will reveal a special pattern. It is these specially-patterned tree stumps that will attract Mushrooms throughout the year. The Clover, Music Note, Triforce and X are extremely rare. 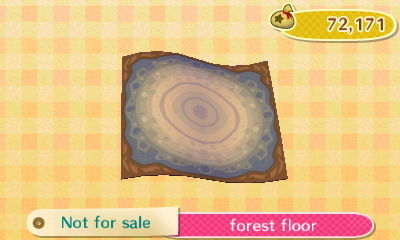 If your interest in stumps has now been piqued and you wish to acquire these special patterned tree stumps, it may be prudent to plan where the tree stumps should be located. In order to get stumps, you first need to grow trees. The saplings to grow oak and cedar trees can only be obtained from Leif at the Gardening Center, which only stocks one sapling per day. This means that it can take some time to purchase a significant amount. However, since oak and fruit trees will produce the same patterns on tree stumps, it is easier to shake some fruit off of existing fruit trees and then plant the harvested fruit to grow more trees. Trees need at least one tile of space around them in order to grow, so don't plant them directly next to rocks, public works projects, river banks, ponds, other trees, houses, or buildings. In addition, villagers moving into your town can create issues as there are no set places where new villagers can move in. 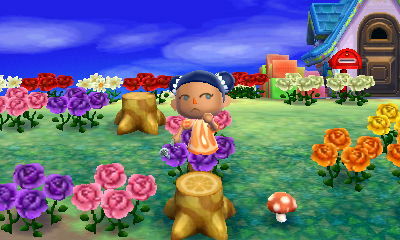 At any time your trees and stumps can be eliminated by a new villager plonking their house on them. 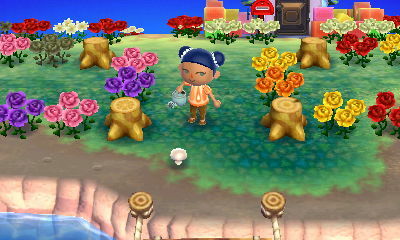 If you intend to keep stumps as features, try planting them one space away from a permanent building such as the Town Hall, Re-Tail, or your main character's house. Unfortunately, this still won't guarantee that your stumps won't be destroyed but it may help lessen the frequency. It should be emphasized that trees must be fully grown before being chopped down to produce a specially-patterned tree stump. 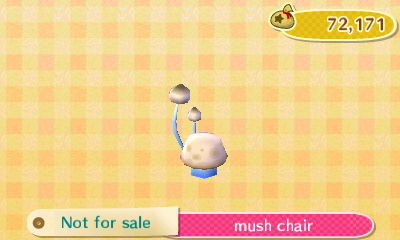 In addition to Mushrooms available all year next to specially-patterned tree stumps, Mushrooms also appear daily in your town throughout November. Scour your town each day to find five Mushrooms. Unlike the rest of the year, the Mushrooms in November don't grow only near specially-patterned tree stumps. Instead, they can be found in your town area next to any fully grown non-palm tree or a corresponding tree stump. In addition, Mushrooms can be found around fully grown bamboo and bamboo stumps. The five daily November Mushrooms spawn only if other Mushrooms have been picked up. 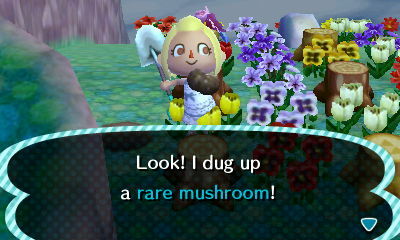 This means that no new Mushrooms will spawn if the previous day's Mushrooms were not picked, similar to fossils. If five Mushrooms are left outside, no November Mushrooms will spawn. Therefore, you should clear your town of Mushrooms by the end of October in order to get the November Mushrooms. Also, be sure to clear your town of Mushrooms on a daily basis throughout November. 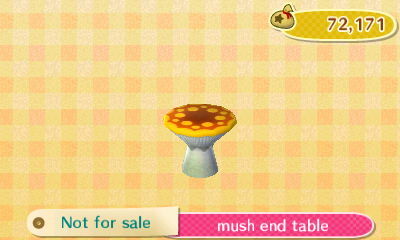 Exclusive to November Mushrooms is the opportunity to collect pieces from the Mush Series. Of the five Mushrooms spawning daily, one will be a piece of the Mush Series in disguise. 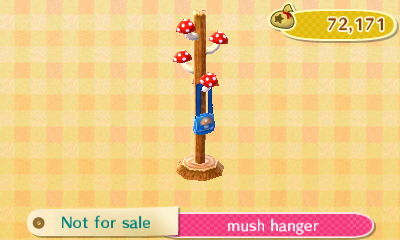 This series is available only from picking Mushrooms in November, and cannot be obtained via the Happy Home Showcase or the Shopping Catalog at the Nooklings' store. 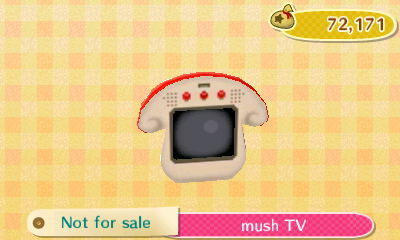 The Mush Series items aren't as profitable as some of the other series that are acquired at other times of the year. 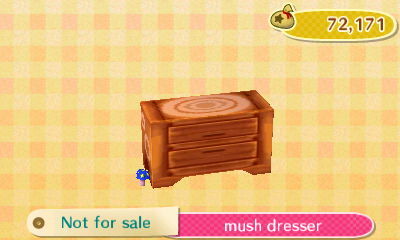 To get a better price for selling these items you can enact a Wealthy Town ordinance at the Town Hall by speaking to Isabelle. 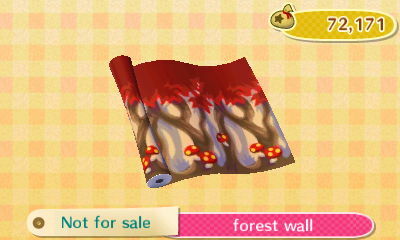 This will bring you slightly more profit, but will also mean you pay more for items you buy in your town. 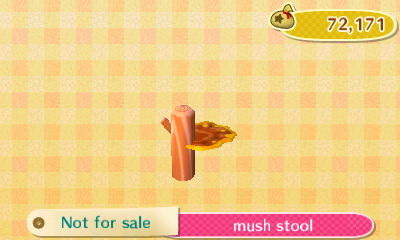 Alternatively, you can hang on to the Mush Series items until Reese at Re-Tail offers you a better price. Outside of Re-Tail is a noticeboard informing you of a daily offer naming items that Reese will pay double for. 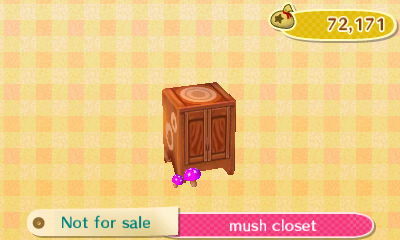 This changes each day, so check the noticeboard daily to discover when Reese is paying double for furniture items. Wallpapers and flooring have their own daily offers as well. 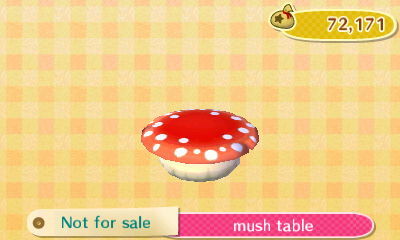 If you want to decorate your town with Mushrooms, you can place them on any part of the ground. This includes even the stone areas outside the buildings. Just be sure to not leave Mushrooms out in November if you want new ones to spawn. Equally, if you don't want any Mushrooms spawning in November, simply leave at least five Mushrooms outdoors during the entire month. 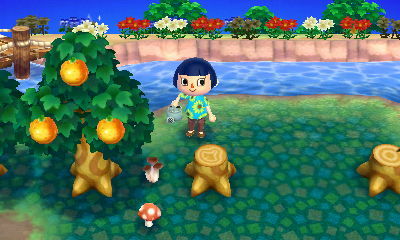 If you don't like the idea of patterned stumps randomly placed in your town, you can always plant trees in specific places, such as part of a path, and use the silver axe to guarantee special patterns. That way you have control of where your specially-patterned stumps are, and can harvest Mushrooms occasionally. When chopping down trees to get specially-patterned stumps, a silver axe is best. Patterns created are random so you are likely to get repeats. If that happens, just dig up the stump and plant another tree in the same space. 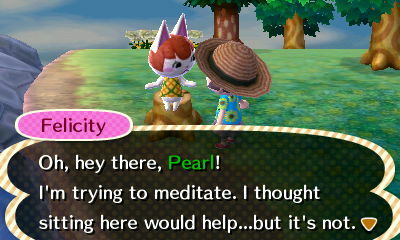 A cute feature of any stump you create, whether or not it has a special pattern, is that both you and the villagers can sit on them. 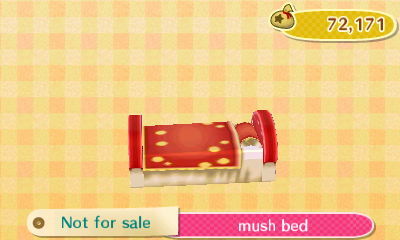 Sometimes, villagers can be found asleep on them too. If you can bear to sacrifice the Bells from the higher value Elegant, Rare, and Famous Mushrooms, then you can get your character to eat them! Bear in mind that the Famous Mushroom is a Super Mario one, so you may receive a bit of a surprise... Enjoy!